Buy Qi Organic, Fairtrade Loose Leaf Tea Gunpowder - 100g in the UK from our online shop or directly from our independent Scottish store. Our most popular green tea! The high quality of the original small tea leaf means that unlike other Gunpowder teas, Qi Gunpowder has no bitterness. The best green loose leaf tea in general distribution. An honest Gunpowder Tea which has none of the binding agents sometimes associated with Gunpowder teas of lesser leaf quality. Small, hand-picked tender young leaves are tightly rolled into the shape of pearls, resembling gunpowder pellets, which unfurl when brewed into the original full leaf, producing a delicious, pale golden tea. The excellence of this tea comes from the quality of the original tea leaves which are young and fresh and in the preparation: The preparation of the tea into tiny little balls is an excellent way of retaining the full properties of the leaf. Stronger in taste than Chun Mee, a very small amount of tea is needed per cup. The high quality of the original small tea leaf means that unlike other Gunpowder teas, Qi Gunpowder has no bitterness. Usage Heat fresh water to over 80°C. Allow 1/2 teaspoon per cup. Allow to brew for 2-3 minutes. Best enjoyed without milk or sugar. We sell real Qi and other Loose Teas directly from our shop in Scotland and online throughout the UK. View more products from Qi. Where can you buy real Gunpowder Green Tea safely online? If you are wondering where you can buy Qi Organic, Fairtrade Loose Leaf Tea Gunpowder - 100g safely online in the UK, then shop with us. We are an actual health foods shop; with real people selling real foods and products. Our award-winning independent shop is located in Stirling, Scotland since 1976. You can buy our Loose Teas in store or safely place an order with us online or over the phone. 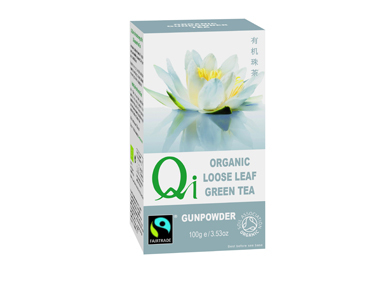 Gunpowder Green Tea - Qi Organic, Fairtrade Loose Leaf Tea Gunpowder - 100g in Loose Teas and Tea Loose & Bags.